The KLIM Latitude combination is wowing motorcyclists around the world and is well-known for its versatility and its high level of comfort. 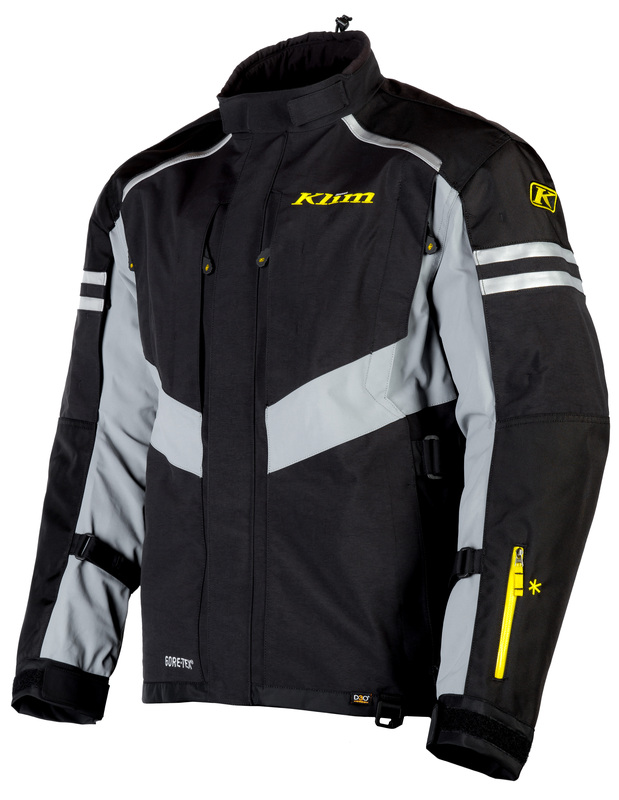 It is the ideal product for newcomers to the world of KLIM technical riding gear! There is the rock-solid GORE-TEX® promise “GUARANTEED TO KEEP YOU DRY®”, the 2-layered GORE-TEX® Performance laminate in the core area, and the GORE-TEX® 840D CORDURA® laminate, which has been worked into the more exposed and stressed areas of the jacket and trousers: the combination of top quality materials offers everything a motorbike enthusiast could wish for. Not to mention the effective ventilation system: 4 water-tight, adjustable ventilation slits in the front and one large ventilation slit in the back of the jacket ensure perfect temperature control. The trousers have four ventilation slits each, one on the front and one back of each thigh. The integrated D3O® protectors on the shoulders, elbows, hip and knees as well as a large-scale protector on the back are active safety features. Highly reflective 3M Scotchlite™ ensures maximum visibility, especially in poor visibility conditions and at night. The aim of the Latitude gear is to provide the wearer with reliable all-round protection and comfort 365 days a year. In high temperatures, the ventilation system ensures effective cooling. In rain and wet weather, the GORE-TEX® promise “GUARANTEED TO KEEP YOU DRY®” guarantees the greatest possible comfort. And in extreme temperatures, we recommend the KLIM base layer system for individual solutions. The Latitude jacket is available in blue/black, grey/black and black/hi-vis, the trousers in grey/black and black. RRP: Latitude jacket € 599.00 / Latitude trousers € 559.00. For extra large or extra long sizes, there is a surcharge of € 20.00.